“Moral License”, “Relative Behavior” … and the New York AG. New York Attorney General Eric Schneiderman was a very public face of the #MeToo movement. He lambasted Harvey Weinstein for his “despicable” abusive behavior against women.. He encouraged victims to come forward and vowed to prosecute any and all men who abuse women women … especially those leveraging the power of their high positions. Apparently, “any and all” didn’t include one Eric Schneiderman. The answer is simple and predictable … his behavior was rooted in 2 cognitive biases: “moral license” and “relative behavior”. We see moral license in play everyday, everywhere. It’s the climate change zealot who drives a gas guzzling SUV to whole foods … it’s the grossly overweight nurse coaxing us towards healthy behaviors … it’s the greedster who advocates for higher taxes while paying little into the kitty. Briefly stated, people have a tendency to believe (often sub-consciously) that their heroic efforts to promote a common good gives them some leeway to behave in a manner that is “slightly” at odds with the behavior that they are publicly promoting. The “slightly” part is tied to the notion of “relative behavior”. Think: “all of the other kids are doing it” and “At least I’m not as bad a he is”. Even bad behavior may be conscience-free if somebody is behaving even worse. 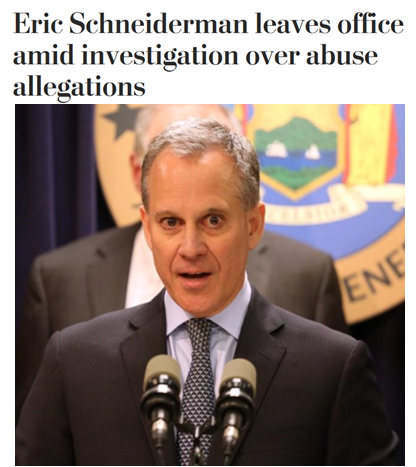 Put the concepts together – moral license and relative behavior – and Schneiderman’s behavior is not only explainable, it’s predictable. His resignation remarks were telling … phrases like: “I contest these charges” (note: “contest” not “deny”); “I have always fought on behalf of abused women” (a paraphrase of “I have earned a moral license”); “I have never committed sexual abuse” ( yeah Eric, but what about physical abuse?). His public crusading against abusive men was undeniably doing good. So much good that he thought he had a moral license for some bad behavior. As long as the bad behavior wasn’t too bad. As long as it didn’t outweigh his otherwise good behavior. Weinstein is alleged to have committed both physical and sexual abuse. On a relative measure, Schneiderman didn’t consider himself to be behaving as bad as Weinstein. That made his behavior ok.
Chalk it up to “moral license” and “relative behavior”. And. to paraphrase the Shakespeare: “Beware if the man doth protesteth too much”. This entry was posted on May 9, 2018 at 6:34 am and is filed under Cognitive biases, Moral licensing, Relativ behavior. You can follow any responses to this entry through the RSS 2.0 feed. You can leave a response, or trackback from your own site.